Twinkles is committed to good, clean, family fun. Whether it’s a private home birthday party or a large corporate family event, Twinkles will bring lots of fun and laughs. Have the Best Party Ever! Contact her today for your event in Toronto and the GTA. Fully insured, always professional. Think of a zoo and then see what Twinkles can do! She creates a wide range of balloon animals and hats to please kids young and old (adults too!). 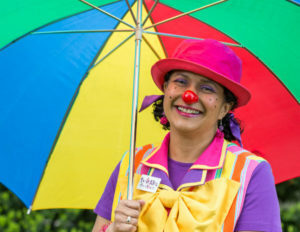 She entertains with humour and silliness – who doesn’t love a balloon! See Twinkles Balloon Animals. Kids love face painting! Whether it is a small cheek or arm design, or a full colour face, Twinkles face painting is sure to please both boys and girls. See Twinkles Face Painting. A funny show with silliness and magic – Twinkles has lots of tricks up her sleeves. Audience participation makes this a super fun time with smiles and giggles. Twinkles can also stroll your event or festival with silly pocket magic. This pre-school program is perfect for very young children. A program including kids’ songs, fun party games, stories or puppets can be tailored to your group. Fun and easy parachute games can be included even in a small space. Want something fun and active? Got a large space? Party games are good fun for the whole family. Traditional games like musical chairs, and exciting relay games are great for kids of all ages! Contact Twinkles today to book great entertainment for your next party or event! Hi Twinkles! Thanks so much for coming! The kids had a blast! You did a great job! Thank you!